Yukinori Yanagi made a name for himself by getting ants to sculpt for him. While getting his second MFA, Yanagi must have learned during that sculpture is too much hard work. All that building and hammering and thinking. Ugh, why do something yourself when you can get someone else to do it for you? He turns the ants into artists, setting them loose in sand-boxes or on paper, he simply records their ideas. Their main concepts seem to be escape and dig. But it’s not just laziness (or laziness at all, he would follow ants on his hands and knees for days), he actually loves the ants so much. He wants to show you what ants think of flags and money and art (spoiler alert: not much). Animal rights activists however also love ants, and they’re not that into the way Yukinori uses them. They actually sued for the ants’ freedom at the 1993 Venice Bienniale and his installation was exhibited as ant-less sand designs. That’s kind of like hanging a blank canvas on a gallery wall, but people have actually done that too. Anything goes in contemporary art. Yukinori is more than just an artsy ant farmer. Homeboy turned an entire island into a museum—he actually lived on a houseboat docked there at Inujima for a while. After making the island museum for rich folks he went and made an art center in a shuttered middle school on another island. Well OK, Japan is all islands. But Art Base Momoshima is for artists, including Yukinori himself. He uses the space to display some of his bigger works, like his MFA thesis sculpture which includes 500 oil drums, a car, and a giant hamster wheel. He can’t really get away from animals, he now lives in a town that made international headlines in 2015 for creating a Google Street View map from cat level, with pins for store cats and everything. Yukinori Yanagi (柳幸典, Yanagi Yukinori, born 2 May 1959) is a Japanese contemporary artist. He earned a bachelor's and master's of fine arts, both from Musashino Art University. From 1986, Yanagi began to exhibit artwork such as those using ants and soil balls that represent dung beetle rolled balls, addressing the issues of “movement” from the perspective of an outsider of the art world’s system. Yanagi had an opportunity to exhibit works at the Hillside Gallery in Daikanyama, where he showed various pieces including a smoke performance piece I Feel Yellow. Yanagi was awarded the Excellence Award in Art Document from the Tochigi Prefectural Art Museum of Fine Arts in 1987. Yanagi moved to United States after he received a scholarship from the Sculpture Department of the Graduate School of Yale University School of Art in 1988, where he studied under Vito Acconci, Frank Gehry, among others. His graduating piece, Wandering Mickey earned him an excellence award. 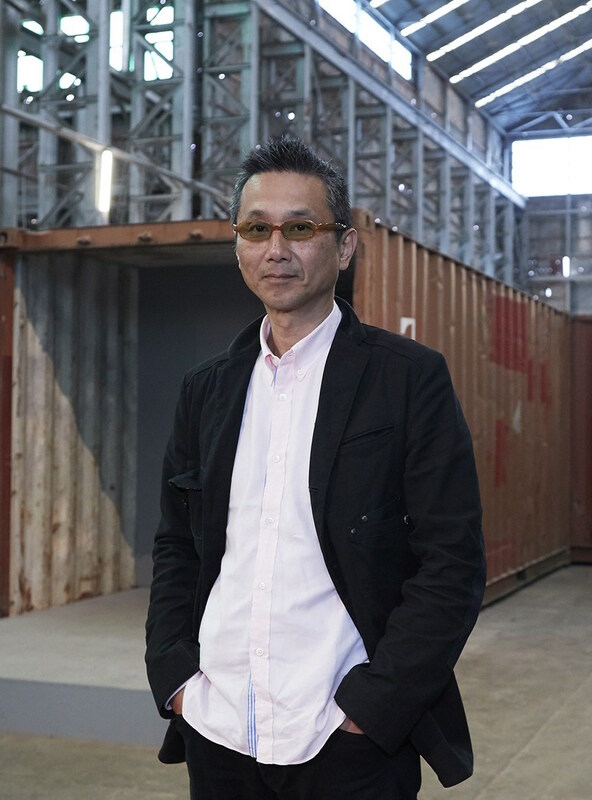 After graduating from Yale, Yanagi held solo exhibitions first in New York’s Storefront for Art and Architecture in 1990, and in 1991 in Los Angeles’s LACE (Los Angeles Contemporary Exhibitions). It was then that his work, The World Flag Ant Farm (1990) was exhibited. This piece features national flags made of sand being destroyed by ants moving through them. This work was featured on the cover of Art in America, one of the leading art magazines in the States. Yanagi moved to New York where he started to work internationally. The World Flag Ant Farm was awarded the Aperto Award at the 45th Venice Biennale in 1993. He created an art project on Alcatraz Island, San Francisco Bay’s former prison island, in 1996. Yanagi’s “Hinomaru-series” works feature Japanese pop culture icons and attracted attention as it touched on the issues of Japanese social, political and economic ideologies. It has been influential on artists of the same generation including Takashi Murakami and Masato Nakamura. “Hinomaru-series” includes Hi-no-maru 1/36, shown at New York’s Storefront For Art and Architecture just before the Gulf War, Self-Defence at Hillside Gallery in 1990, using Tamiya’s toy military tanks and Banzai Corner at Hosomi Gallery in 1990, with hundreds of Ultraman and Ultra Seven superhero figurines. In 1992, with the aid of the Asian Cultural Council, Yanagi was invited to the PS1 Studio Program in New York. In the same year, he exhibited Hi-no-maru Illumination, a huge Japanese flag in neon at the Fuji TV Gallery. He was also invited to open a solo exhibition at the Naoshima Contemporary Art Museum (now Benesse House at Benesse Art Site Naoshima), which had only newly opened in 1992. His stay on Naoshima inspired an idea for a new work on an island in the Seto Inland Sea. After three years of looking for an appropriate site, he came across Okayama Prefecture’s Inujima, which is dotted with copper refinery ruins dating back to the Meiji Period, and the idea of the Inujima Project was formed. He began traveling between New York and Inujima. In 1995, Yanagi’s vision for the revitalization of the whole island of Inujima by turning the copper refinery ruins into art and using renewable energy, was realized with the support from Benesse Corporation’s CEO at the time, Soichiro Fukutake. In 2008, Inujima Art Project’s “Seirensho”, which combines features of the house of Yukio Mishima and Heritage Industrial Modernization, opened and is now known as Inujima Seirensho Art Museum. The project took a total of 13 years to complete. It became a forerunner of Art Setouchi, the art projects on the islands in the Seto Inland Sea. In 2000, Yanagi became the first foreign artist living in New York to be invited to exhibit at the Whitney Biennial, alongside Cai Guo-Qiang. Yanagi presented his “Study For American Art” series, which included his Three Flags, Jasper Jones inspired piece. In the same year, after the first retrospective exhibition at Hiroshima City Contemporary Art Museum, and just before the September 11 attacks, Yanagi closed his studios in New York and San Francisco, moving to a self-designed studio situated on the north face of the mountains facing the Genkai Sea, in Itoshima City, Fukuoka prefecture. The solar energy system used there is passed on to the Inujima Project. In 2005, after returning to Japan, Yanagi began working as an associate professor in the Faculty of Art at Hiroshima City University. He started contemporary art and theory major in the faculty of Arts and launched the Hiroshima Art Project, utilizing unused facilities due to the exposure to radiation, as sites to exhibit artworks. The Inujima Art House Project during the 1st Art Setouchi in 2010, featured three installations in the Inujima village, by Yanagi in collaboration with architect Kazuyo Sejima. After the completion of the Inujima Project, he took on the challenge of transforming an old junior high school on the remote island of Momoshima Island, Onomichi City, Hiroshima prefecture, to make ART BASE MOMOSHIMA, and work in the Onomichi Channel area. In 2016, Yanagi’s large-scale solo exhibition at Yokohama’s BankART1929 explored the 30 years of his artwork and took up the whole museum. He unveiled Project God-zilla, a work about the Fukushima Daiichi nuclear disaster of 2011. This exhibition was selected as the best exhibition of the year from both the Mainichi Shimbun newspaper and the Yomiuri Shimbun newspaper. Check out the full Wikipedia article about Yukinori Yanagi.